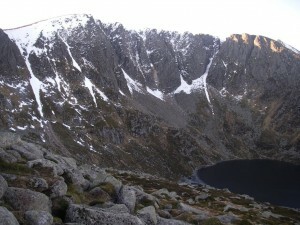 SAIS Southern Cairngorms Blog » Snow? No real changes to report today, bit colder up the hill and a bit warmer in the valleys and of course no sun. Some snow due tomorrow, probably not enough but it’ll be a start. Hopefully we will not see Lochnagar like this for the rest of the season! This was taken Christmas Day.